NEW ORLEANS – It’s a second-straight sweep in the swamp: the Florida men’s track & field program have earned Scholar Team of the Year honors for both the 2013 Division I indoor and outdoor track & field seasons for the second consecutive season, the U.S. Track & Field and Cross Country Coaches Association (USTFCCCA) announced Wednesday. As the highest-placing teams with at least a 3.00 cumulative team grade point average at both this season’s indoor and outdoor NCAA Division I Championships, the Gators stood out among 111 men’s programs that combined academic and athletic achievement to earn All-Academic Team honors this season. The full list can be found below. 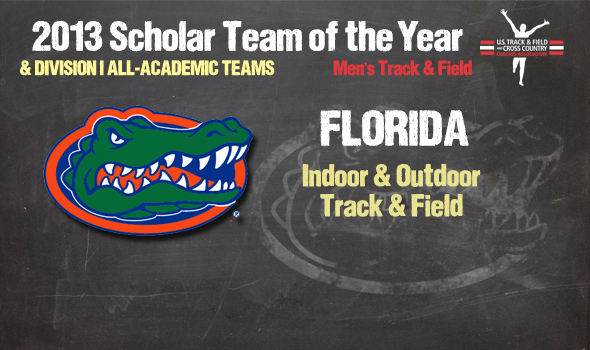 Finishing the 2012-13 campaign with a cumulative 3.016 team GPA, the Gators swept the indoor and outdoor Scholar Team of the Year honors in 2013 with runner-up and co-champion finishes at the NCAA Division I Indoor and Outdoor Championships, respectively. Florida also accomplished this feat during the 2011-12 academic year when it won both the indoor and outdoor team titles. Prior to Florida claiming both indoor and outdoor Scholar Team of the Year honors for two straight academic years, no men’s team had accomplished that since the award’s inception in 2007. The Arizona State women in 2007 and 2008 were the first Division I team to win both indoors and out two years in a row. The Gators’ runner-up finish at the NCAA Division I Indoor Track & Field Championships with 59 team points was powered by two individual titles and eight other scoring performances. Outdoors, Florida took advantage of a 4×400 relay mishap by Texas A&M to earn a co-national title with the Aggies. Both teams finished with 53 points, as Florida took both relay titles and another in the triple jump along with four other scoring efforts to share the title. The USTFCCCA also announced Tuesday the 2013 Division I All-Academic Track & Field teams. A total of 111 institutions earned the distinction as a result of earning a cumulative team GPA of 3.00 or higher. Arizona was the top team in Division I with a cumulative team mark of 3.511, including indoor and outdoor track Scholar Athlete of the Year Lawi Lalang. Santa Clara posted the second-best cumulative team GPA at 3.506, just barely ahead of Chattanooga at 3.505. The Atlantic 10 was the best-represented conference with eight men’s teams earning All-Academic Team nods. The Big East and Ivy League both added seven teams to the list.